The Multicultural Affairs Centers Presents the /Su·prem·a·cy/ series: A series of programs that are geared towards deepening our conversation and understanding of supremacy in the U.S. We are hoping that through this program series, that we can engage students in a critical reflection of how we can apply historical context to the current socio-political climate to develop a broader sense of supremacy and how it impacts us in todayay’s world. We have put together a series of programs to address different aspects of supremacy through less traditional programming means. We hope to engage students in ways that challenge their current perspectives, and have done so by challenging ourselves to provide educational opportunities outside of a lecture, forum, or panel format. As a part of the series we will have an essay contest with a prize of a $500 Bookstore gift card! Which program was most impactful to you and why? In your own words, define supremacy and discuss its current socio-political context. How do supremist ideals impact the Truman community? Outline a detailed action plan to help reduce supremist ideals in the Truman community. There is no minimum requirement, but please limit essays to 5 pages maximum. Essay submissions will be due by Friday, December 8th by 5:00pm. A discussion of supremacy and Harry Potter. Discussion outlines a research study conducted that correlated empathy for non-magical-born witches and wizards in the text to a real life application of empathy to things like immigration. How do the stories we are exposed to inform our level of empathy for those that are different than us? Do you remember the old game The Oregon Trail? Come participate in a real life game experience about settling the West. With so much to gain, who stands to lose? 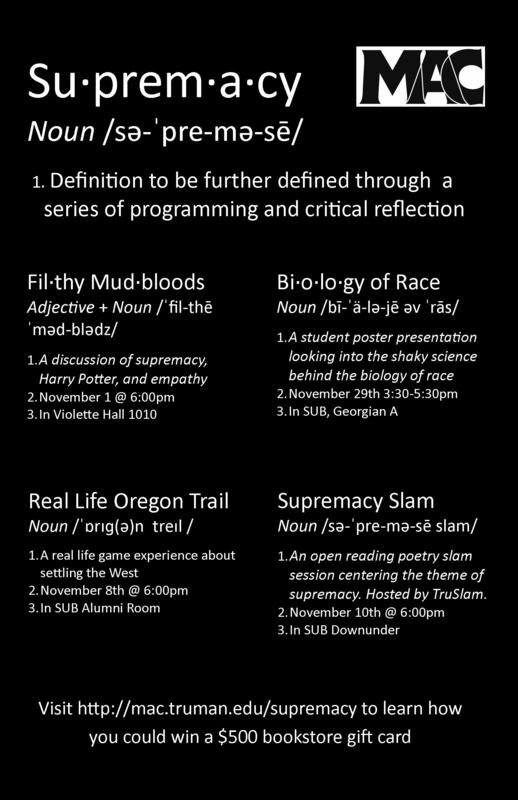 An open reading poetry slam with all of the poetry centering the theme of supremacy. Open to anyone willing to sign up and showcase their poetry. Hosted by TruSlam. Dr. Ben Wodika’s Biology Research students have delved into the topic of the biology of race. They will be doing poster presentations with their findings. The conclusions may surprise you.